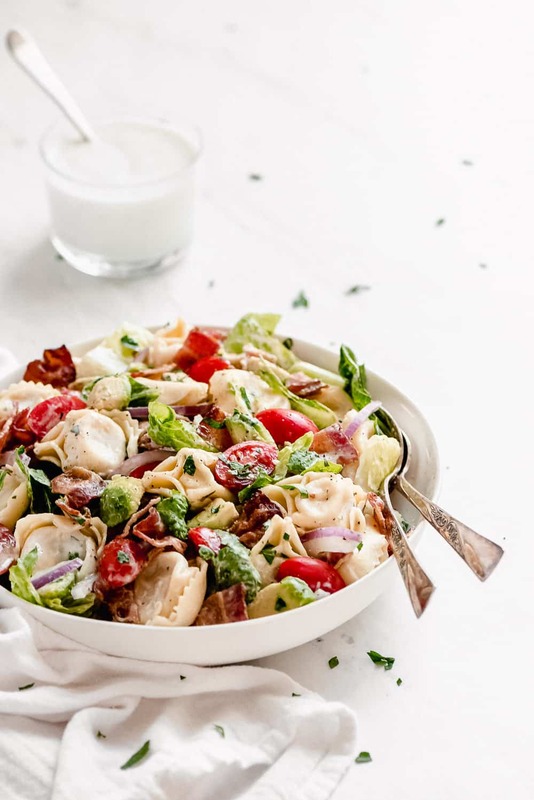 BLT Tortellini Pasta Salad is your favorite sandwich turned into a delicious refreshing salad you can share with others. This salad is so easy to make and perfect for serving at warm weather gatherings. 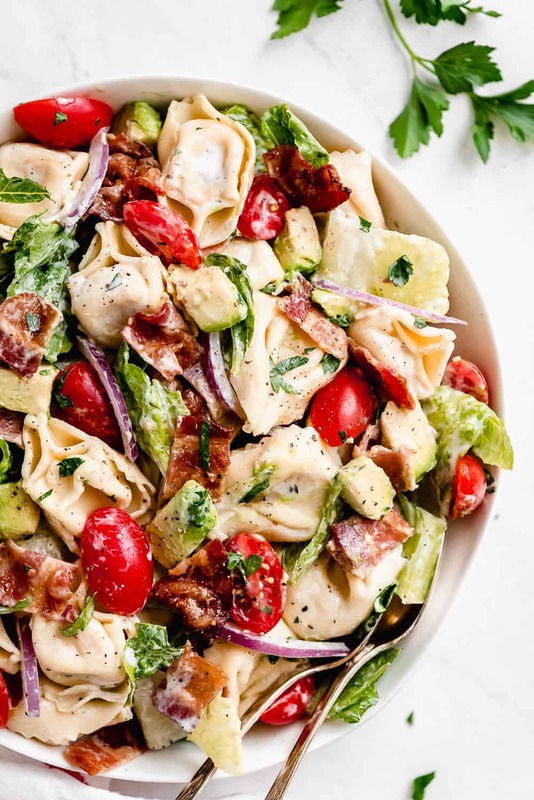 With loads of bacon, crisp Romaine lettuce, juicy tomatoes, and cheese filled tortellini, it’s sure to be a hit! Spring is finally here! The outside barbecue potlucks will be in full swing before you know it and this BLT Tortellini Pasta Salad needs to be present. Don’t forget The World’s Best Baked Beans, Classic Potato Salad, and Ambrosia Salad too! A BLT is one of my favorite sandwiches! The combination of warm crispy bacon, refreshing crisp lettuce, a perfectly ripe and juicy tomato on toasted bread… mmmm! Standing in for the bread in this recipe is pasta. And not just any pasta, cheese filled tortellini! Guys, this is just too good not to share! 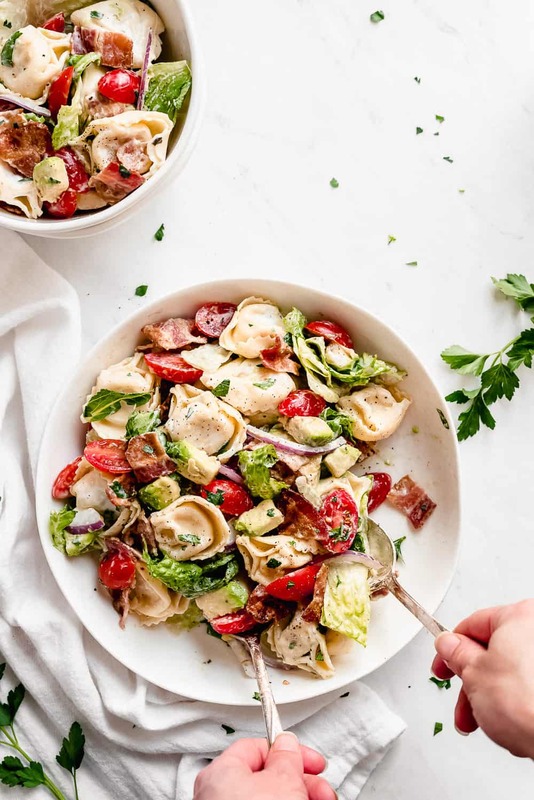 How to Make BLT Tortellini Pasta Salad? In a large pot, boil salted water and cook the tortellini according to the directions on the package. Drain and then place in a bowl of ice water to chill. Once the ice melts and the pasta is cold, drain again. Cook the bacon over medium heat in a skillet or bake in the oven. Drain the bacon on a paper towel lined plate. Chop up when cooled. 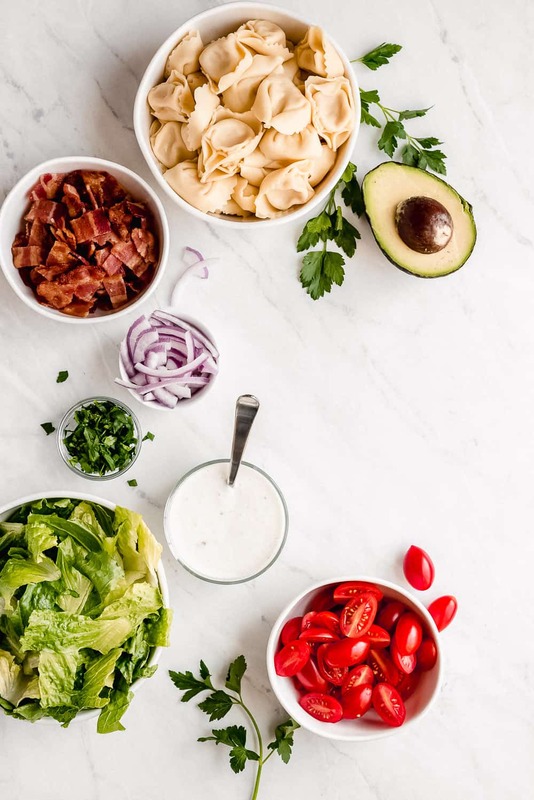 For the dressing, whisk together the Greek yogurt (or mayonnaise), milk, and ranch seasoning. 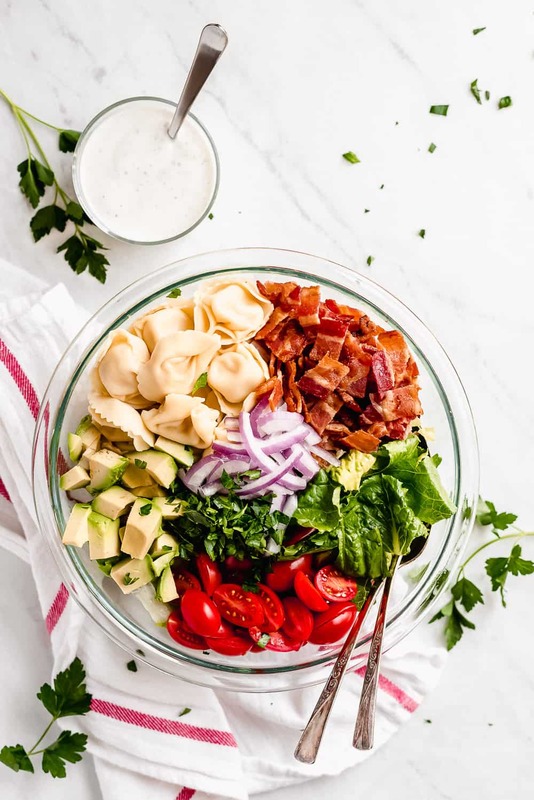 In a large bowl, add tortellini, bacon, lettuce, tomatoes, avocado, red onion, and parsley. Pour on desired amount of dressing and toss until evenly coated. 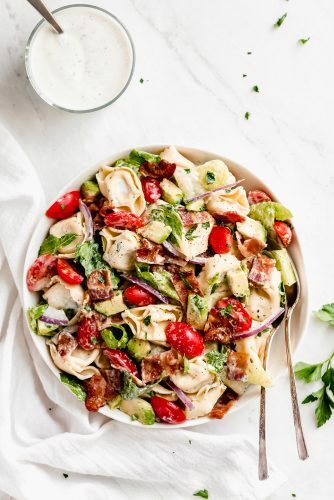 Can I make BLT Pasta Salad in advance? Yes! Make the recipe as directed but place the bacon in a separate air tight container so it doesn’t get floppy. You also need to wait to add the avocado until just before serving since avocados brown quickly. Salad dressing makes lettuce go limp so it’s always best to wait to add it until right before serving. Keep the dressing in a jar and pour it over the salad just before serving and then toss the salad together. Line a baking sheet with parchment paper, lay the bacon slices on a large rimmed baking sheet in one single layer and bake for 12-15 minutes at 425 degrees F until desired crispiness. Cooking time will depend on the thickness of the bacon. There’s no need to flip the bacon. Just place the pan in the middle of the oven and in about 15 minutes you’ll have perfectly cooked bacon without getting grease all over your stove top. Want more pasta salad recipes? Enjoy these! *If using mayonnaise, you’ll need to add up to 1/2 cup more milk to thin it to the right consistency.